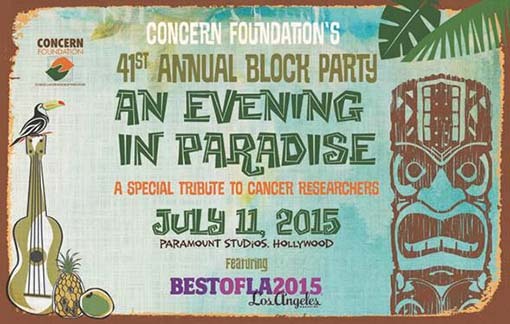 (Los Angeles, June 7, 2015) – Concern Foundation presents its 41st Annual Block Party, An Evening in Paradise, on Saturday, July 11, 2015 at Paramount Studios in Hollywood (5555 Melrose Ave. Los Angeles, CA). The block party and fundraiser celebrate the achievements of cancer researchers to date in which proceeds generated from the evening will help fund critical projects in the field of immunology. The event, which is expected to bring a crowd of 4,000 and raise over a million dollars [let me verify the $ before we publish], will be outfitted by a number of sponsors and vendors who bring gourmet foods, specialty cocktails, and interactive experiences, such as live and silent auctions, photo booths, casino style gaming and more. In 2014 alone, the annual block party raised over 1.4 million dollars throughout the evening. Some of their noteworthy contributions include the Mercedez-Benz interactive lounge, ARIA Resort & Casino photo booth, the Macau experience, casino style gaming and more. One of the most anticipated portions of the event, the live auction, will be hosted this year by award-winning actress Jill Whelan from “The Love Boat”. In addition, the block party boasts live musical entertainment on four stages for all to enjoy, featuring Oskar Caraya & The Enclave and DJ Dwayne Brown & D’ City Sound as well as a number of themed performances such as steel drums and salsa dancing. To accompany the live entertainment, more than 70 food and beverage vendors showcase the best of their menus, from Los Angeles classics like Pink’s Hot Dogs, Lawry’s Catering, Fogo de Chao and Slater’s 50/50 to popular newcomers such as Bourbon Steak by Michael Mina, Prufrock Pizzeria, Spread and Tipple & Brine. Other venues will showcase sweet treats, such as Cookie Good, and companies like Tito’s Handmade Vodka will craft specialty cocktails and other yummy libations. Every year, the annual block party pays tribute to a special guest of honor. This year however, the 41st Annual Block Party will pay tribute to more than 750 cancer researchers who have been funded by Concern in the past 47 years and who have demonstrated their achievements as leaders committed to finding innovative treatments and ultimately, cures for cancer. Since its inception in 1968, Concern Foundation has invested $57 million dollars in more than 750 gifted scientists committed to understanding how the immune system can be used to treat cancer. Concern Foundation’s mission is to conquer cancer by providing essential funds to support the early stages of discovery by the most promising and innovative immunologists. Recent trends show that cancer is expected to surpass heart disease as the leading cause of death in the U.S. by 2030. Funding for cancer research has never been more critical in order to reverse this trend. For more information, please visit: www.concernfoundation.org.